Jerusalem is a setting that tempts novelists, but it comes with high risks attached. Muriel Spark's only bad book, The Mandelbaum Gate, is set there. And about Robert Stone's Damascus Gate, the less said the better. Both of these books, in very different ways, are weighed down by their self-conscious portentousness, a besetting sin of the Big Jerusalem Novel. And then, apart from such pitfalls, there's the ever-present danger of Current Events, which can make fiction seem irrelevant, hopelessly out of touch. 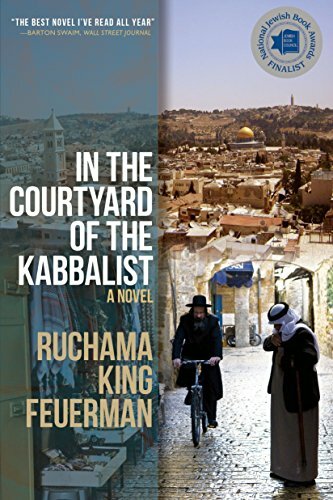 All of which makes the triumph of Ruchama King Feuerman's In the Courtyard of the Kabbalist that much more remarkable. Feuerman's novel was first published in 2013, as an ebook, followed by a paperback edition earlier this year. It is neither weighed down by its own seriousness nor (like another variety of the Bad Jerusalem Novel) cynically ironic. Feuerman tells her story with a light touch and a keen sense of absurdity, and yet—in a way that is all too rare in contemporary fiction, no matter where it is set—she is unafraid of being dismissed as "sentimental." Animated by a generous faith, hopeful yet never saccharine, at once sweet, funny, and sad, In the Courtyard of the Kabbalist is an uncommon delight. A month after his mother died, Isaac Markowitz, forty, plagued with eczema and living on the Lower East Side, sold his haberdashery at a decent profit and took an El Al flight to Jerusalem. At the Central Hotel, the most pious in all of Jerusalem, he stumbled upon a pamphlet shuffled in with the tourist brochures, a veritable Yellow Pages of saints, zaddiks, rebbes, kabbalists, and other holy men. Rebbe Yehudah's name stood out—a kabbalist described as having a gift for analyzing difficulties of the soul. It didn't hurt that Rebbe Yehudah's address was within walking distance from the hotel. That opening paragraph by itself should be enough to send you straight to Feuerman's book. The main action of the novel begins in March 1999. As we've learned in the prologue, the rebbe has invited Isaac to stay with him and his wife (who turns out to be a force in her own right) and assist them in their work. Each day supplicants come with a wild variety of requests and entreaties. Isaac marvels at the rebbe's insight in dealing with them. Also introduced here, in a parallel story-line that will intertwine with Isaac's, is Mustafa, a Muslim who works on a janitorial crew on the Temple Mount, picking up trash, sweeping. Mustafa is crippled in a particularly cruel way: his head is twisted to one side so that he can never look straight ahead. His chance encounter with Isaac—but what is chance?—will set the action of the novel in motion. There is a love-story too, as wonderfully improbable as it is commonplace, and a jailhouse gathering for worship, and much more. (In one of its aspects, the novel is a story of vocation, finally recognized and shouldered after long deferral.) Altogether delicious. Copyright © 2014 Books & Culture. Click for reprint information.